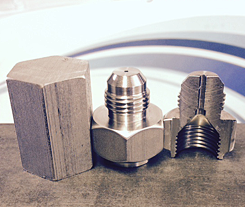 Welcome to Mohr Manufacturing, your resource for small parts production machining. By using state-of-the-art equipment and reliable methods, we are able to produce your parts in a timely, cost effective manner. We offer quick turn around, money-saving redesign options, and a beneficial supplier partnership. Our small shop can compete with big shops by offering lower prices. Our workers do not have production quotas, so we never feel the need to cut corners. Instead, we focus on applying SPC inspections during cycle time to control variables within specifications; refining processes, as needed. We have been a supplier for: Solar Turbines®, Linear Measurements®, Turbines Inc.®, North Sails®, Seacoast Science, Inc.®, Badger Meter, Inc.®, and Senior Aerospace Ketema® in most cases more than 25 years. To become a valuable partner to each customer by innovating solutions to "problem jobs" and stocking quality product ahead of need.